Created by the Devil reincarnated behold! 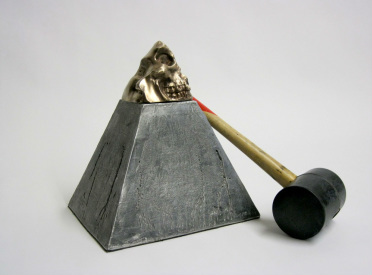 Kneel before the powers that is The Death Metal Press! This press is more then just a brand. It is a ink-less printing press that harnesses the power of fire and tormented souls to create images on a two dimensional picture substrate. "Woodblocks" are transitioned from wood to metal and then printed upon the flesh of the meek so that they always remember that we once rocked this place! Eric Fuertes and Dumbo Press take their skills and knowledge to the West Side of San Antonio which is locally known as San Anto. In one week and under the guidance of Eric Fuertes the youth of San Anto imagined and constructed an interactive sculptural printing press. 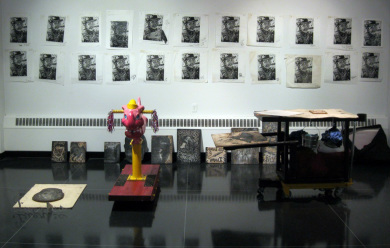 The press was affectionately named "Espiritu de San Anto" and was debuted at their first annual Printmaking Pachanga. It was one amazing week for all involved. Big love to the other half of Dumbo Press Mr. John Medina! Without your vision and hustle none of this would have happened! Enjoy the video and to all in San Anto thank you for your time and love! We will see you soon and keep on keepin' on! Well after much work and anticipation here is the debut of The Dental Press! Forged from the sins of man in the bowls of my sculpture studio this revolutionary machine will allow for salvation through the printed image! Printpalooza! Hosted by the Mary and Leigh Block Museum artist from all over the country such as Drive By Press, Cannonball Press, Eric Fuertes, Dancing Bear Press, Spudnik Press, Absrtract Science, Los Dos, and Northern Illinois University students take on the Block for a day of art and energy! 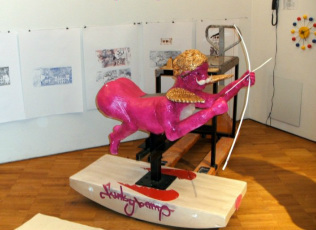 Dumbo Press unveils my latest creation, The See-Saw Press, at Tom Huck's Evil Prints for SGC in St. Louis. Debuting another creation constructed from pure anger and aggression! Changing up the art game and makin' stuff happen behold the Pyramid Press...and get the hell out of the way! Here is the video of my travels to Estonia in which I created a new printing press in conjunction with the Kumu Art Museum and The Estonia Academy of Fine Art. All work was initiated and completed in ten days. 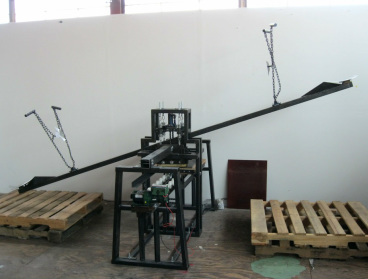 Here is the "Cupid Press" which was made "For Love Not Money." Here is the debut of the UFO Printing Press which can print both etching and woodblock prints! After much fiddling and figuring stuffs out I've created a Zero Pressure Print utilizing Osmosis, Science and things. Reinterpreting and revolutionizing the game this artist is just gettin' started. Merging two of the most revolutionary processes invented by modern man (iron pouring/printmaking) I debut the WORLDS FIRST "Iron Cut Woodblock" aka the "El Diablo Process." These two worlds collide into a cataclysmic eruption of creativity and ingenuity. With years of experience and risk taking expect to see more from this visionary, inventor and true patriot! Utilizing a kinetic wood mold I sling some aluminum and tame the volatile.